The well-being of every employee is taken seriously here at The Motley Fool. With a full-time Wellness Coordinator, multiple treadmill and exercise bike desks, and free food refrigerators filled with organic snacks, our company has undeniably built a productive yet health-conscious work atmosphere. So it should be of no surprise that many of these holistic approaches stem straight from our CEO, Tom Gardner. It’s not unusual to see Tom utilizing our office’s various wellness opportunities, whether he’s working from a treadmill desk or enjoying a snack from the kitchen. In fact, Tom drinks a specific smoothie daily, which is filled with nutrient-dense ingredients based off of the ANDI Guide. This Whole Foods Market scoring system rates around nutrient content and, as you can see by this chart, the higher the score, the better the ingredient. Top-rated ingredients in Tom’s smoothie are kale, flax seeds, and blackberries. After serving this smoothie to curious Fool One members at a recent event, I asked Tom why he is persistent about his recipe. He replied that it serves as a huge source of energy, providing him with good, clean food to start each day. Tom has even taped segments for The Fool with this drink in hand. 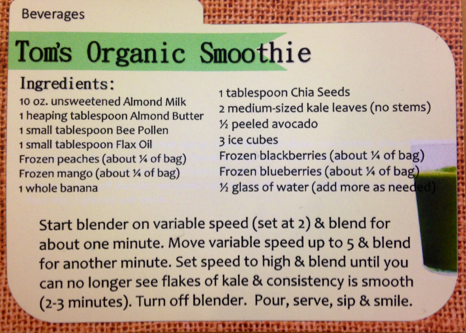 If you’re curious to give Tom’s smoothie a try, the recipe is below. Though I can’t say that your investing knowledge will be better if you drink it, perhaps your health will see a higher return. Any detail on servings this recipe makes? Seems to be more than one. I like your smoothie ! I have my own. Dude – this recipe sounds great, but must be for a small army! LOL Note to newbies at smoothie making: they don’t keep real well – the nutrients don’t have much of a self life – so only make enough for drinking right then and there. Enjoy! Sounds like a good recipe, Tom!